If you like to have the flexibility to set your own schedule, save a little $$ by cooking a few of your own meals, this unit provides for all you will need. The management was very attentive to our needs (quickly replace a broken coffee pot). 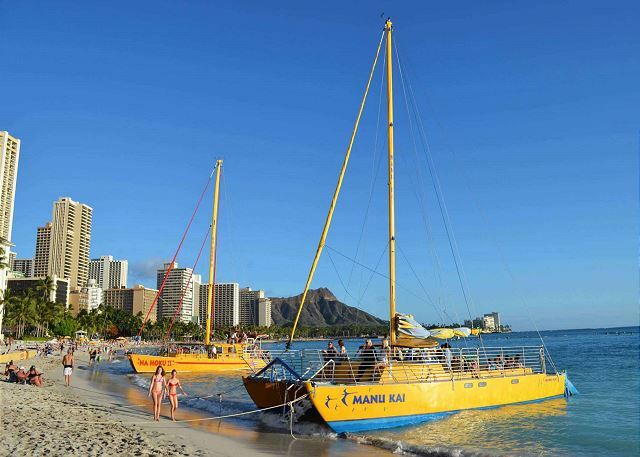 This is Waikiki, and you will have some 'night life noise' in the evenings. Recommend paying for the parking with the unit. 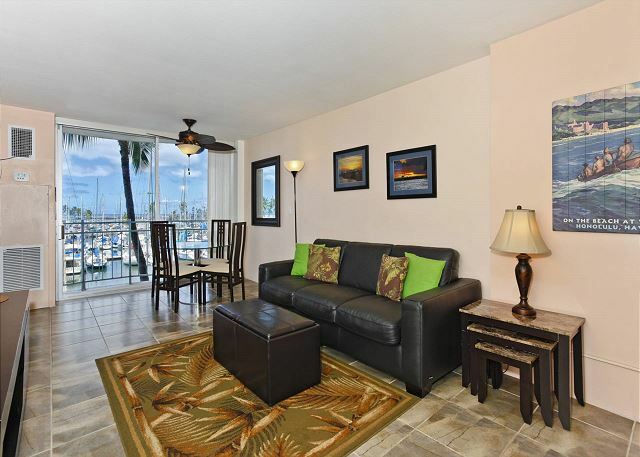 Aloha and mahalo for taking the time to post a review and recommendation of this great condo. We're delighted you enjoyed your stay! It makes our day to know our dedicated staff was able to make your vacation a wonderful experience. We look forward to welcoming you back in the near future. Mahalo, for the wonderful 5 star review and recommendation! We're delighted to have provided all of the needs you required for an enjoyable stay! It makes our day to read such an enthusiastic review and we're so glad that you appreciated the convenient location of the fabulous condo! I will pass your feedback on to the team. We look forward to your next visit! Our family (2 adults, 1 teen and 1 child) rented this condo for 12 nights and were very happy with everything from the initial booking experience, communication and reception from the property manager Paul. 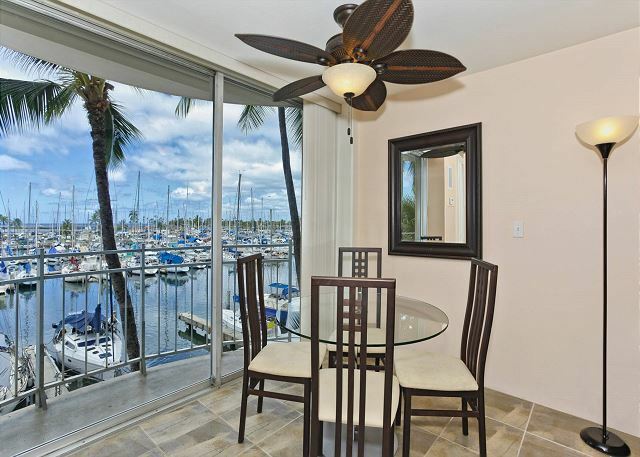 The condo is exactly as pictured and described with a lovely view out to the marina that we were able to experience some lovely sunrise and sunsets. The location is VERY handy to activities, shopping and food. We used the BIKI hire bikes that are placed in various places nearby regularly as well. Also included are all the usual kitchen utensils and cooking items required to self cater and there is an ABC right across the road for any urgent supplies. The parking staff and attendants were lovely. We had a car for our entire stay and found the pre-pay parking system just fine, it also helped that Paul gave us directions on how to be efficient. We are from NZ and so we could not download the laundry app to pay for the mmachines electronically so had to collect quarters and some of the dryers did not work very well but there were some hangers in the room so we could dry some things that way. As mentioned in other reviews, it is positioned on the 3rd floor so I would not recommend if you are a light sleeper - this was not an issue for us and we would happily recommend renting this place. Mahalo, for the lovely review and for choosing to stay with Captain Cook Resorts during your recent Holiday visit. 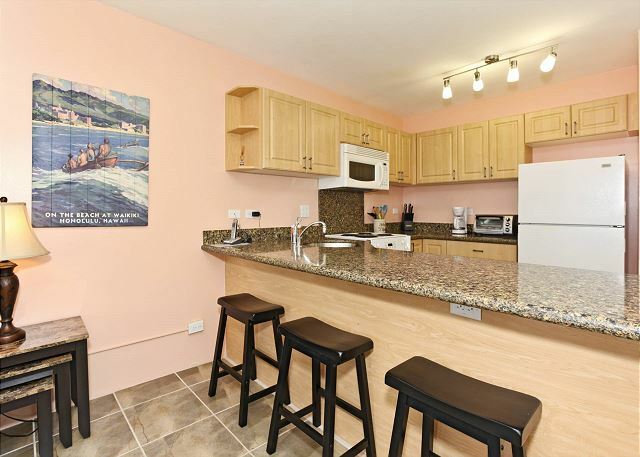 We're so glad you appreciated the convenient location, views and parking of this great condo! Thank you for taking the time to send us detailed input about your stay, I will pass it on to our Team. 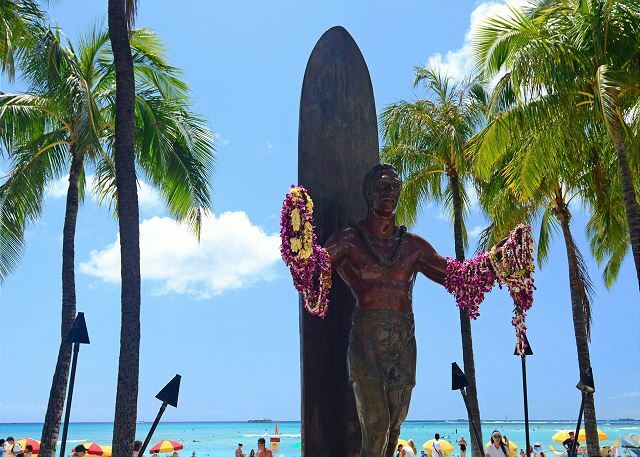 We look forward to welcoming you back on your next visit to Waikiki. Fabulous location, and value. Clean, comfortable with an easy check in. Mahalo for the 5-star review, Sandra! So glad to hear you enjoyed your stay in this great condo! We look forward to your next visit! I would have rated the stay 5 stars except the parking information was not correct, you had to provide your own quarters ($5.00 is needed to wash & dry one load) for laundry, the AC unit would not keep the set temperature and had to be reset periodically. Mahalo,Wayne! We appreciate the feedback and recommendation of your recent stay. We are sorry you felt the parking information was not correct. 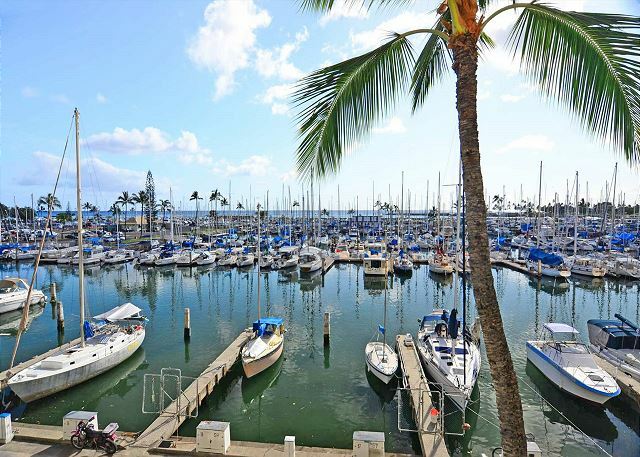 Our listing description of Ilikai Marina unit 396 states, "Coin operated laundry facilities located in the building and on site parking is available for fee. 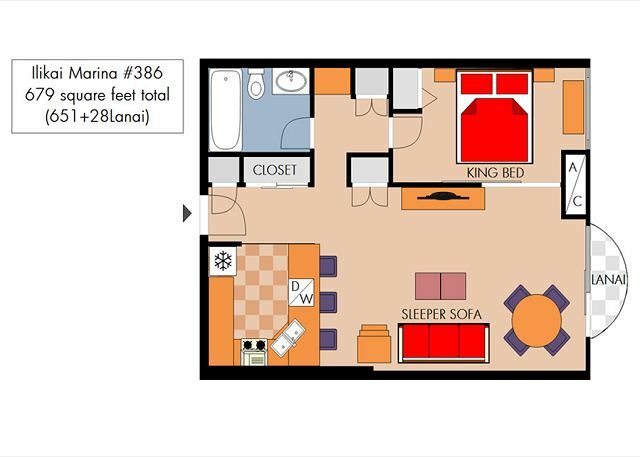 Parking, subject to availability, is $15-$20/night (parking rates subject to change)". Thank you for alerting us to the issues you encountered with the the A/C, we will have your property manager make sure it is operating correctly. We value you as a customer and hope you will keep us in mind for future vacation plans. My first visit to Hawaii and it was a Great Experience! I will definitely come back! Mahalo, for the wonderful review and recommendation! We're delighted to have provided all of the needs you required for an enjoyable stay for your first visit to our beautiful islands! We look forward to welcoming you back on your next trip! We had a great vacation and this rental was fantastic! I would definitely book again for my next visit to see my son! Thank you!! It's always great to get this kind of feedback - we're so glad you enjoyed your stay! We will pass your feedback on to the team. We look forward to seeing you on your next visit! Great room, great view, great customer communication from the property management focused all the time to make sure that the customer have a great and pleasant stay. I believe it was the best room from the whole condominium from my point of view. Mahalo for posting a review and recommendation of your recent stay! 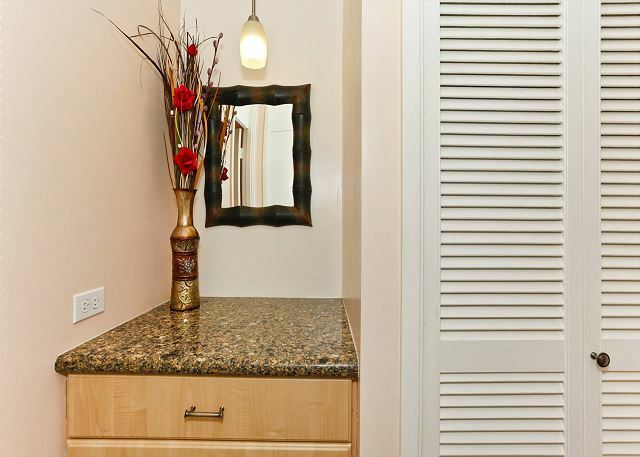 We're delighted your Holiday visit was enjoyable and you appreciated this great condo! ll pass your feedback onto the team, and we look forward to your next visit! Everything is perfect, except the pub downstairs is a bit noisy in the evenings. Mahalo! So glad to hear you enjoyed your stay - we are dedicated to offering great accommodations and service, and we're so glad your visit was enjoyable. Everything about these condos are what was expected great location, clean modern rooms at great prices...well looked after. Aloha! We were delighted to hear your stay was enjoyable - we are dedicated to offering great accommodations and friendly service. We appreciate the 5 star review and recommendation and hope to see you on your next visit! 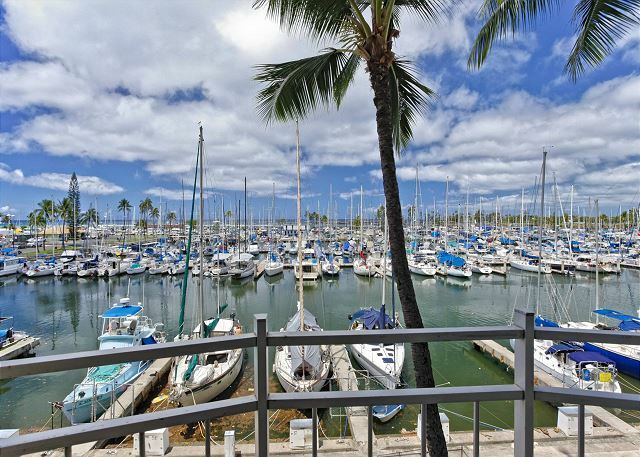 Our stay at Ilikai Marina with Captain Cook was really good. Paul Tucker was very nice and professional as the property manager. He was able to answer all of our questions and help us when necessary. The room was very nice and well maintained. Although the location is good and the room was nice there were a few problems with the rental that I feel were out of Captain Cook's control. The balcony has a gap on the right side big enough for our kids to fit through. We were not warned about this beforehand so I think no one might have guessed anything could fit through. Also we had a rental car that we tried to use on July 4th. Unfortunately, the company that runs the parking garage connected to the building ignores parking passes on this day. Other reviews mentioned the noise from the restaurant downstairs but it didn't cause any trouble for us or our children. Mahalo for the 5-star review! So glad to hear you enjoyed your stay in this great condo! We appreciate the feedback and will look forward to your next visit! 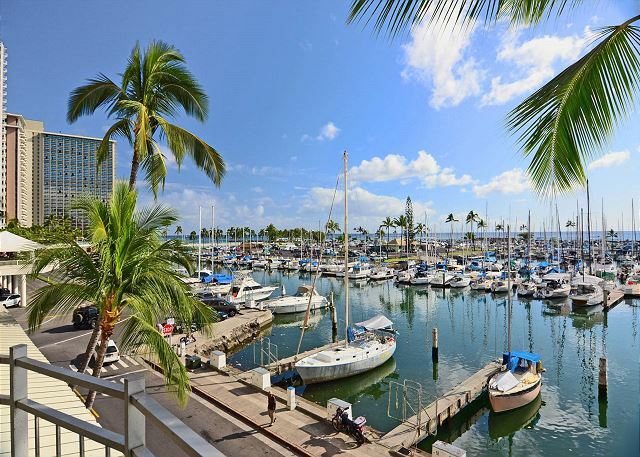 We love staying at the Ilikai Marina and working with Captain Cook Resorts. Condo #386 was very clean and comfortable but, being on a lower floor, it was somewhat noisy at night (although it did not keep us awake). Paul Tucker, the property manager, was delightful to work with. We enjoyed our stay very much. Thank you very much for the positive comments and recommendation. It’s always encouraging when customers acknowledge the good work of our team. We look forward to seeing you again soon. Our vacation rental had everything we could possibly need, a kitchen, the view, a living area, location, comfy bed, etc. We loved it. Mahalo for the 5-star review, Larry! So glad to hear you enjoyed your stay in this great condo! We look forward to your next visit! We had a wonderful stay in Wiakiki. The condo was perfect and had plenty of space. The only down side was the bed. I think the mattress needs to be replaced. They layout of the condo was great for 4 ppl. It is a very short walk to the beach. Everything is within walking distance but if you do rent a car the parking fees are very reasonable. Mahalo for the positive comments and recommendation! We will pass your feedback about the mattress on to your property manager. We look forward to seeing you on your next visit! Condo was comfortable, with the exception of the bed which is creaky and slightly lumpy. Mahalo, Glenys! We appreciate the feedback and will look forward to your next visit! 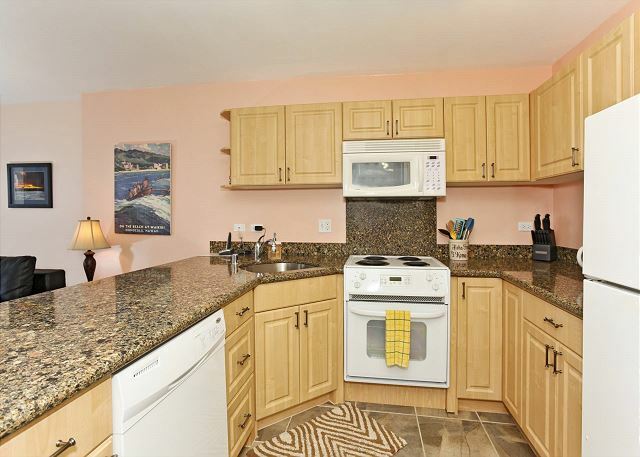 Great condo - good location as described amenities. Would rent again. Mahalo, Michael, for the wonderful review! Hope you are able to plan a return trip soon! Easy to check in, everything worked well. It was a pleasure to use the kitchen, as I must say, going out for dining is crazy. 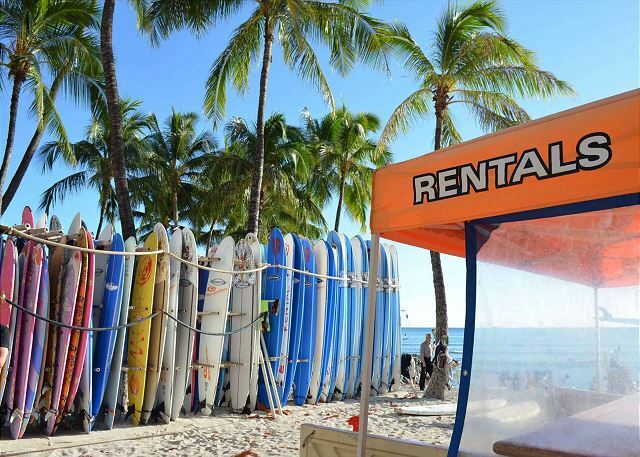 The prices at Waikiki-Beach are not from this world. Use the bus to visit Pearl Harbour, the Single ticket is $ 2,50. The busstop is close to the main street. Mahalo for taking the time to share your comments and recommendation of your recent stay, Harry! Happy to hear you appreciated the use of the kitchen and the great bus system, too! We hope your future travels do include another visit! See you then! Great location and wonderful view! We plan to stay in this unit again. GREAT LOCATION!!! I WILL BE BACK!! You're welcome back any time, Mark! Thanks for great review! I was in Honolulu for business and decided to try a condo instead of the normal hotel. I absolutely loved this unit and loved the location. 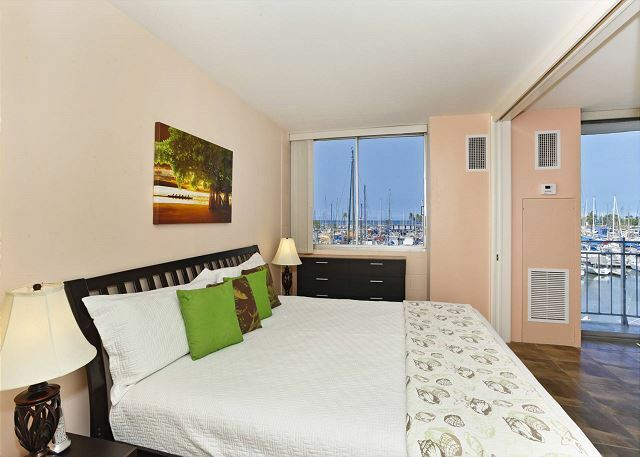 The condo was very clean, well equipped, the air conditioner did the job, beautiful view of the marina and ocean. I was initially concerned that I was right above a restaurant and bar, but it never disturbed my sleep during my 9 night stay. I must also sing praises to Paul from Captain Cook Real Estate. Paul is professional, polite and always willing to help in any way he can. This will be my 1st choice for all future trips to Honolulu. 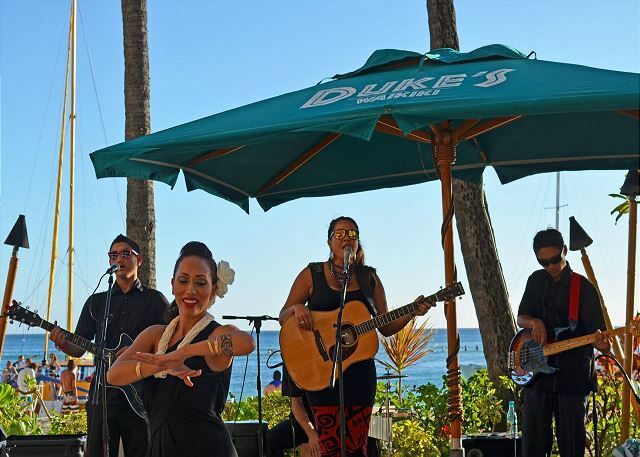 Mahalo, Cindi for the spectacular review! We will definitely pass your great comments on to Paul; he's a real asset to the Captain Cook Resorts team! Second time to beautiful Oahu! So happy we rented a condo instead of hotel room. Much more relaxed and spacious. Awesome to have a kitchen! Loved dealing with Captain Cook Rentals very easy, love the app, and great employees! The unit was just as it looked, the pullout sofa was uncomfortable but found one side better then other. We would have liked having one mornings worth of coffee/tea in unit since we arrived late at night. Everything else in unit was super! Just a note about restaurant down below...very noisy specially Thursday -Saturday and you can really hear street traffic and people, but we are in a city! Mahalo for the wonderful review and feedback, Oralee! We know how important it is to have a starter supply of coffee/tea in the unit upon your arrival and we apologize those items were not in place for you. A new sofa bed is on order! Mahalo, Kerry, for the great review! A bed that isn't level IS a big deal - to you and to us, especially when a quick call to the property manager could have resolved the issue. For future visits, please remember to notify us if you have any issues during your stay. After all, you're on vacation, but we're not, and we want to ensure your stay is as great as it can be! Loved the location and the property was exactly as described. We just happened to come at a time when they were doing building maintenance (eg. water shut off for 4 hrs,floor tiling by elevators)Overall still very pleased with our stay and would be happy to return. Thank you. Fourth time with Captain Cook and thoroughly enjoyed the vacation. Unit was as described with no surprises. AC is old - but did the job, eventually. Ceiling fan was great. Sofa bed was surprisingly comfortable for one person, possibly two. Kitchen utensils were so-so, but worked for two adults and two kids (oldest 3yrs). Local property manager (Paul) was very pleasant and accommodating. Street noise not an issue when patio door closed. Overall, highly recommended. Only problem with the vacation was the diminished value of the Canadian dollar. Mahalo, Ian - glad to have you back again! We'll get those kitchen utensils updated right away! Hope to see you again soon . . . or when the Canadian dollar is looking healthier! Great location. 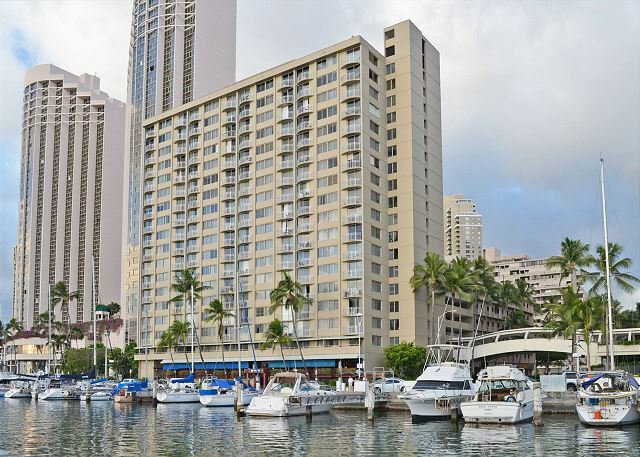 Walking distance to both Waikiki beach and lagoon on one direction, Ala Moana shopping centre the other and cafes/restaurants in another. 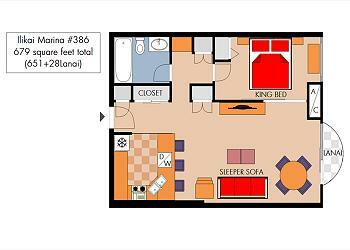 Room ideal for small family. We requested additional roll out cot, as sofa bed not very big. Air con cools, but not very cold. I think this is getting replaced or upgraded in next couple of months?? Will definitely book with Captain Cook again when we come back! Mahalo, Rhonda! We look forward to your next visit! Stayed here with my family on a pre-Christmas holiday. Apartment was lovely and well set up. Paul was a friendly and efficient property manager. Guests should note that the Air Conditioning is massively underpowered and cannot really cool the room in the afternoon sun. Other people staying in the building told me that was true for the whole building, not specific to this condo. Plenty of fans are supplied and if you like it warm you will enjoy your stay. Aloha, Adrian, and mahalo for the great review! 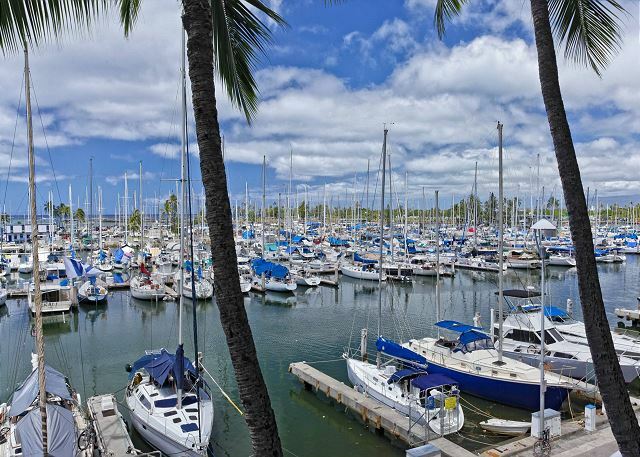 You'll be happy to hear that all air-conditioners and chilled waterlines at Ilikai Marina are scheduled for replacement between (approximately) 3/15/16 and 8/8/16. babymoon December 21 - 30th, 2016. 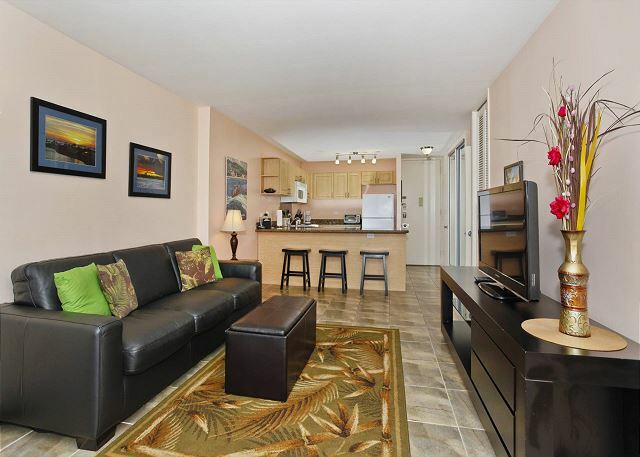 Grat location, great condo. Other than not having any air conditioning (because they were in the process of changing them) the unit was wonderful. It came with all supplies, snorkeling gear etc.. The owner gave us 20% back every day that we didn't have AC. I would definitely stay here again. Mahalo, Ryan! We're so glad everything worked out well despite the lack of air conditioning! Best wishes on the upcoming addition to your family! This was our first ever trip to Waikiki and the first time we have ever stayed in accommodation other than a hotel or organised accommodation with a tour. After our experience with Captain Cook Vacation Rentals, I don't know if we would stay in a hotel ever again. The unit was spacious, very clean, fantastic location, and great value. The whole process was easy and trouble free. I would definitely use Captain Cook Vacation Rentals again. 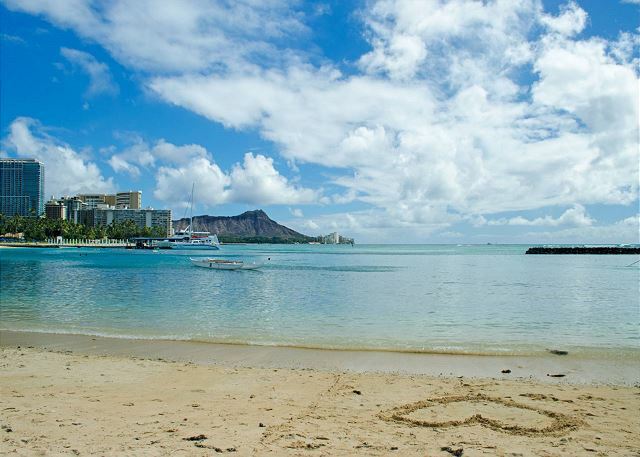 So happy to be part of your first visit to Waikiki and the wonderful world of vacation rentals, and especially glad to hear it was such a positive experience! Hope you can visit us again some day soon! 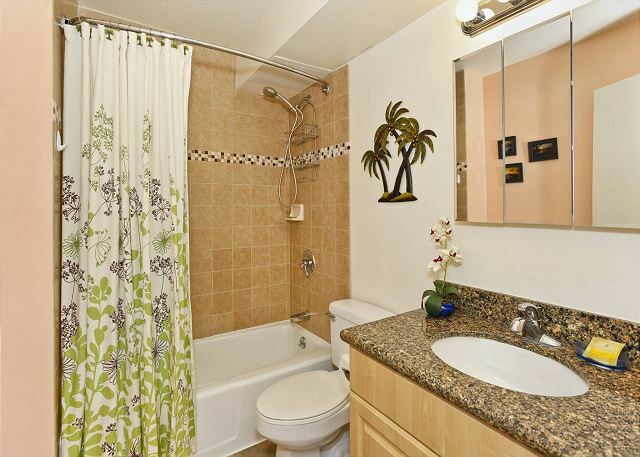 This condo is exactly as described. We loved the view, the convenience, on-site parking, and the spaciousness. We can highly recommend this property! Mahalo for choosing Captain Cook Resorts and the great review and recommendation! We're so glad your visit was enjoyable and look forward to seeing you again. This unit was well equipped and very comfortable. I stayed in this flat for 8 days. Overall it was a great experience. The place was clean, had all that we needed for the stay. 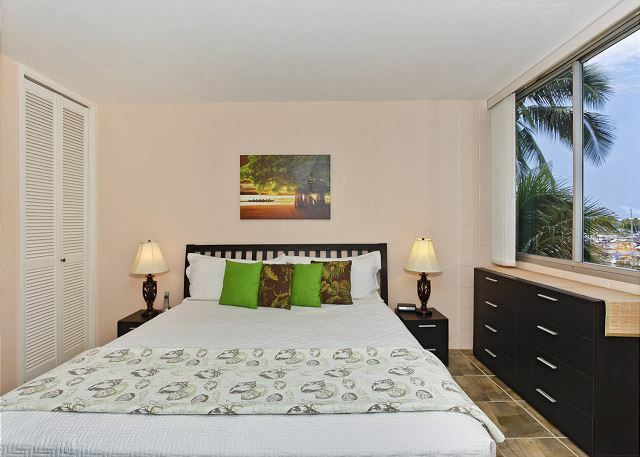 Location was also right by the beach, just 5 mins walking distance to a lagoon nearby. The only thing was that the shower was pretty clogged when we got there, so the bathtub would easily fill when you're taking a shower. But other than that the place was great. Mahalo for the positive comments and recommendation! We hope you contacted your property manager during your stay to get the plumbing issue resolved - that's what he's there for! I stayed at this condo for 10 days. The room is very clean and nice. Because it was located on the third floor, we could hear some noise from the street. But after 23:00it was usually quiet. 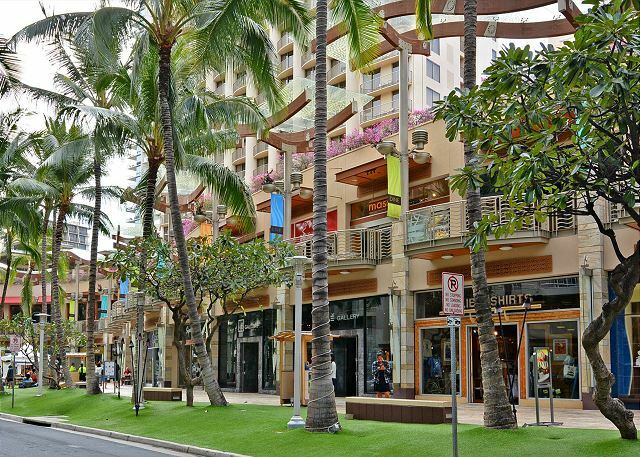 It is only 5mins walk from ala moana shopping center. If there is anything inconvenient, I called the contact person of the Captain cook and they would come in like five minutes. I definitely recommend this condominium. What a nice little condo. The only things we didn't like were the bed was terribly uncomfortable(very very hard) and on the weekend the noise from the main floor pub was a bit loud. The pub we could live with but I don't think we would rent again because of the bed which is too bad because everything else was perfect. The management company was amazing to deal with. Mahalo for posting a review of your recent stay. We're glad you enjoyed the condo! We're sorry you found the bed uncomfortable. There haven't been any other complaints over the last year and a half, but bed comfort is subjective. Perhaps we could have supplied a bed topper to make it more comfortable? Our motto is "If you’re not satisfied with your accommodations, please let us know right away so we can make it right!" Thanks again for choosing Captain Cook Resorts for your vacation stay! We enjoyed the view a lot and found the location really good for us. The bed was too big for the room. The knives were dull. The ice trays did not let loose of ice. Great view at sunset. It was convenient for what we wanted to do, go to the beach, check the harbor, cook good food and eat at good restaurants. Aloha and mahalo for the review and recommendation! We'll see to getting the knives sharpened and will purchase new ice trays. Glad you enjoyed your stay! Place was great! View was fantastic! Comfy and clean! 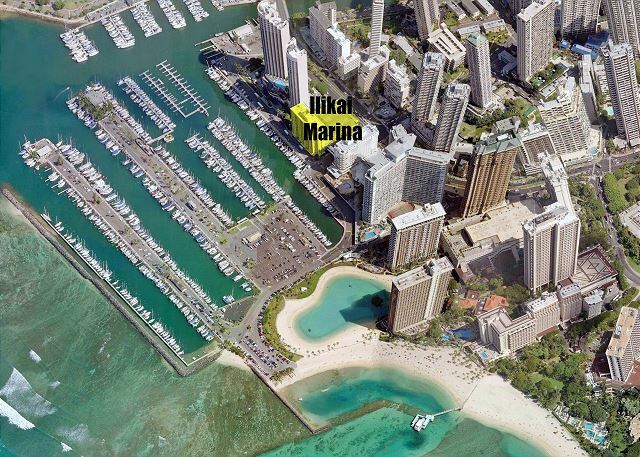 Great place for its location and a lanai on the Waikiki harbor. 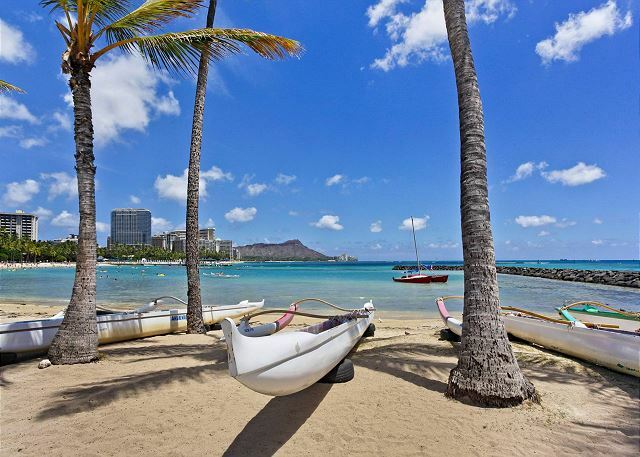 3 minute walk to Waikiki Beach/Hilton Hawaiian Village. There is a bar on the first floor below the units. Fancy restaurant/bar on the third floor. Clean and comfortable. "Free wifi" (it's included in the total cost). Friendly really cool manager! Only issue was the air conditioner did not work that well. Over all I'd do it again! Mahalo Captain Cook! Mahalo for the positive comments and recommendation! It’s always encouraging when customers acknowledge the good work of our team. The AC is maintained regularly, but it will turn off automatically if the lanai door is open. We look forward to seeing you again soon! We had an amazing time. The location of the condo was perfect. We were only steps from the beach and lagoon. We enjoyed watching the boats in the marina and seeing the barracuda that called the marina home. I recommend you pay the extra for parking and rent a car. The room was perfect for two people and the kitchen was well equipped. The only negative thing we can say is that the air conditioner struggled in the evenings, but not enough to change our opinion about thr place. Clean, bright with all the amenities you need. I would highly recommend this condo. Way better and more reasonable than a hotel. 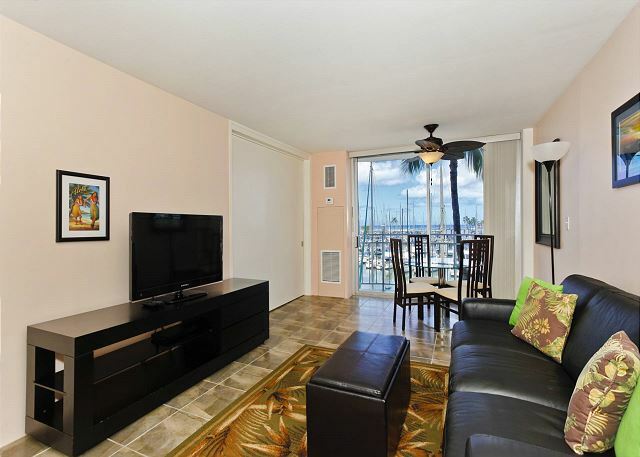 Spacious, clean modern condo, located within very short walk of all Waikiki has to offer. Couldn't be happier with the condo. It was a wonderful experience. Clean, beautiful condo. The view is beautiful. The location is very convenient. Close to bus stop, convenient stores.. The whole process was wonderful, and the location of the condo was great. The condo itself was clean, spacious, and well appointed. I would definitely recommend this to anyone! Mahalo! We're happy you enjoyed the condo - and look forward to your next visit!